It was reported this week that the number of applications for Office to Residential conversions have dropped significantly. 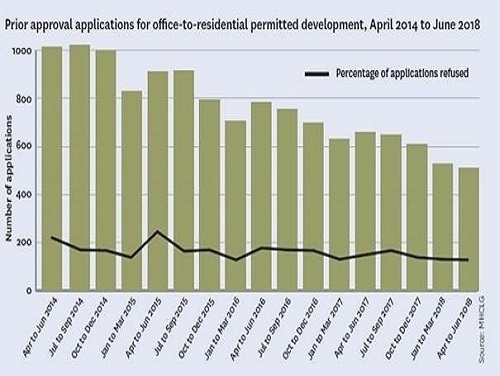 Figures released by the Ministry of Housing, Communities and Local Government show a drop of 22% in the second quarter of this year, with just 511 Office-to-Residential Prior Approval applications submitted when compared to the same period in 2017. As shown in the graph above, there has been a steady decline in the number of applications since April 2014, with the recent quarter representing the lowest yet. No doubt, this is partly due to the intervention of Local Planning Authorities, with the introduction of Article 4 Directions – a manner in which the Permitted Development Rights can be removed from a specific site, area or town/city. The Rights were amended in 2016 to include a consideration of noise. Whilst this did not result in a significant drop in applications, this did cause a minor increase in the number of refusals, as developers came to terms with what the new consideration meant for the application process. However, naturally, the question remains – where do we go from here? The expectation is that the number of applications will continue to drop. Not only have Article 4 Directions had an impact, as well as noise considerations, but there is a balancing in the market regarding the provision of office space. The Rights were introduced, of course, to boost housing delivery – albeit that the success is still being debated. But a knock-on effect has been a reduction in the poor quality office stock, with high quality office stock now in great demand, which is in turn increasing rents. The only way that this downward curve will be reversed is if the government makes further, positive, changes to the rights, such as the ability to demolish/rebuild, which has been considered over the last few years.